Sometimes the overlooked positions at Missouri Baptist University are held by the strongest people. Missouri Baptist University houses a variety of departments and employees, but an often-overlooked position is that of the resident life housekeeper. 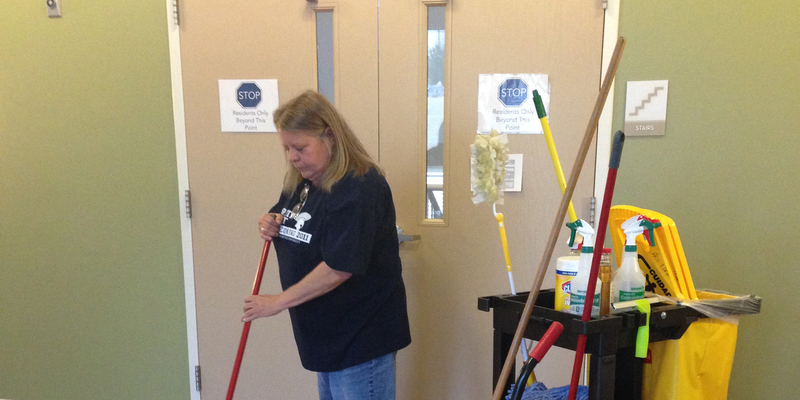 Debra McKibbin, born and raised in St. Louis, Mo., is the woman who leads the resident life housekeeping staff. McKibbin came about the position at MBU almost three years ago, when her son Clayton McKibbin, who also worked at MBU, told her of the position. In order to understand how McKibbin got into the knack of cleaning and enjoying it, she offered some information about herself and her past. McKibbin, who was raised in the neighborhood of Breckenridge Hills, Mo., said she had a wonderful childhood. “My favorite childhood memory is the neighborhood I grew up in and the lifelong friends I made that 50 years later I am still friends with,” she said. McKibbin spoke of her trials raising three children, but has no regrets about how they were raised. McKibbin is truly proud of all of her kids and their accomplishments, but she especially looks up to her son. “I really admire my son, his beliefs and his way of living so spiritually,” she said. So, how did a stay-at-home mom become a full-time MBU employee? “Well, I was a stay-at-home mother for 22 years and unfortunately my significant other and I went separate ways. I had never had a job before, being a stay-at-home mom was my career, so it was definitely an adjustment,” she said. McKibbin had her life turned upside down and now she had the struggle of trying to figure out how to support herself. “The thing that intrigued me the most about the job was being able to support myself and live on my own,” she said. McKibbin is proud of how far she has come in the past couple of years. “I am very proud of where I am and how far I have come. I am making it on my own and it feels really good,” she said. McKibbin cherishes her position not only for the independence she has gained but the friendships she has made. “My favorite part of my job is interacting with the students, plus I have the best supervisor anyone could ask for,” she said. McKibbin’s supervisor, Taira Schertz, director of resident life, was more than happy to talk about one of her own team members. “Debbie is such a wonderful part of the resident life team. She is very dedicated to her job and always has a smile on her face,” she said. McKibbin emphasized her love for her co-workers at MBU. “I work with the greatest people, they truly are the kindest. The resident life staff, maintenance and landscape, everyone is so wonderful here,” she said. However, McKibbin admitted there is one thing she does not look forward to. “The worst thing I do is cleaning the dorms after the students move out for the summer, it is just very tedious work,” she said. Mckibbin seems unsure of her plans for the future. “I really am not too sure of my future plans. I hope that my finances are stable and that I can enjoy life to the fullest, maybe even travel the United States,” she said. McKibbin may still have some obstacles in her future, but she doesn’t plan on throwing in the towel anytime soon. Molly Carver is Social Media Editor for MBU Timeline and news anchor for MBU Timeline-Broadcast. She is majoring in Public Relations with a minor in Journalism. After graduation, Carver plans to find work with a boutique public relations agency where she can utilize her passions for writing and strategic planning.